Although CRT TV’s and monitors have become a thing of the past for most consumers, there are still many stockpiles of CRT monitors littered across the US. One particular stockpile, from an e-scrap company known as Recycletronics, recently came under scrutiny by the U.S. EPA and led state regulators to suspend the company’s license to accept CRTs. During a 2015 inspection, Recycletronics’ CRT stockpile filled nearly 100 corrugated pallet boxes in an outside storage area behind their warehouse. The EPA cited the company for “failing to minimize the possibility of release” of hazardous material at that location. The company was subsequently evicted from its Iowa location in 2015 and the company’s owner, Aaron Rochester, was sued in January 2016 for breaching the company’s lease and using more property for CRT glass storage than its lease allowed for. The Nebraska Department of Environmental Quality also confirmed that Recycletronics was previously sending its crushed CRT glass to Closed Loop Refining and Recovery in Arizona. Closed Loop closed in 2016, leaving tens of millions of pounds of leaded CRT glass at their Arizona and Ohio sites. The former executives Closed Loop Refining and Recovery were ordered to pay more than $18 million for breaking the lease at their Columbus, Ohio headquarters and leaving behind more than 100 million pounds of CRT glass. “Closed Loop was not engaged in legitimate CRT recycling operations at the properties, but was instead engaged in the speculative accumulation and subsequent abandonment and disposal of the CRT waste at the properties without any feasible means of recycling it,” Judge Holbrook wrote in his Aug. 7 judgment. Despite all their troubles, Recycletronics hasn’t closed down. The company currently operates out of a new location in Sioux City, and are actively trying to work on their stockpile. The EPA won’t renew their CRT permit until they comply with state and federal regulations. According to Rochester, authorities have seized documents and copied information from computer hard drives and requested more information about their CRT stockpile. The stockpile of hazardous CRT screens currently remains in a field, directly affects the environment. In the case of Closed Loop, which had five locations across Arizona and Ohio, there are also whole units of CRT monitors taking up lots of space. The total weight of abandoned CRT glass held by Recycletronics is uncertain, but for Closed Loop, figures are massive – around 250 million pounds. If you want to dispose of your CRT screens the right way, you have to find a well-established electronics recycling firm to help you out. Only a company with a proven history of following best practices can assure your scrap will not end up abandoned in an open field somewhere. 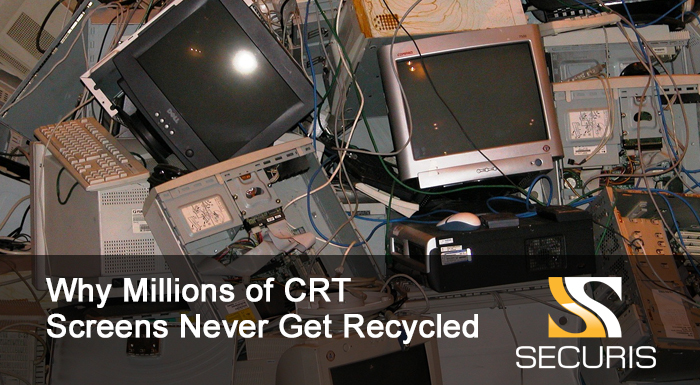 Securis can help you get rid of your CRT waste properly and protect your company from hefty fines. Contact us today to learn more about our services for recycling CRT monitors and other electronic waste. We hold certifications from R2, NAID, and the Defense Logistics Agency, and have a team of experts to ensure your electronics are disposed using industry best practices and processes.